Non running days.... yes, but that doesn't mean no trains at all, as we found out today. We keep busy, the railway doesn't stand still. Arriving at Toddington we were met by this tent... where the frames of 76077 stood last week. A very neat arrangement, that tent will contain the dust generated by the mobile sandblaster. Wish we could take a peep inside. Ah! The door is ajar, and two boilersuits had the same idea. We peered inside. Work is really starting on the Standard 4, see for yourself. 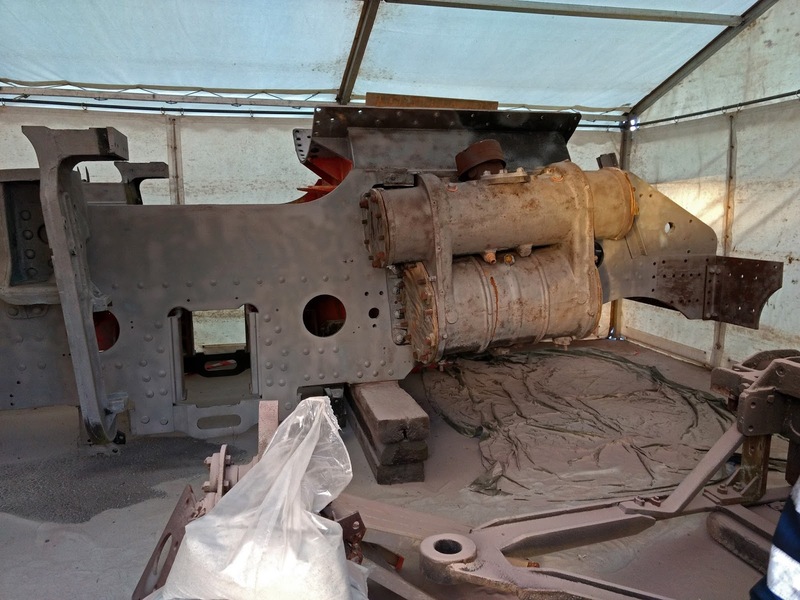 Apparently the shotblasting will be completed by the end of the week already. Fast work! It was a slippery morning, with patches of ice all round and tricky frost, especially on the sleepers. 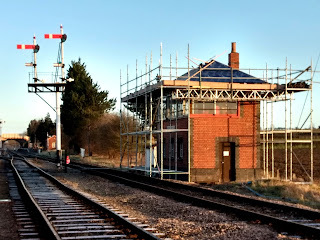 Just a quick look then at the signal box. The scaffolding is now at roof level, with kick boards, and we can now see that the box is getting a new roof. The windows at this end have received a coat of primer too. On the roadway leading into the station a contractor was digging a long trench along the Malvern side. This is to realise a long held wish to beef up our sewerage disposal system, which wasn't really built to receive 100.000 users. 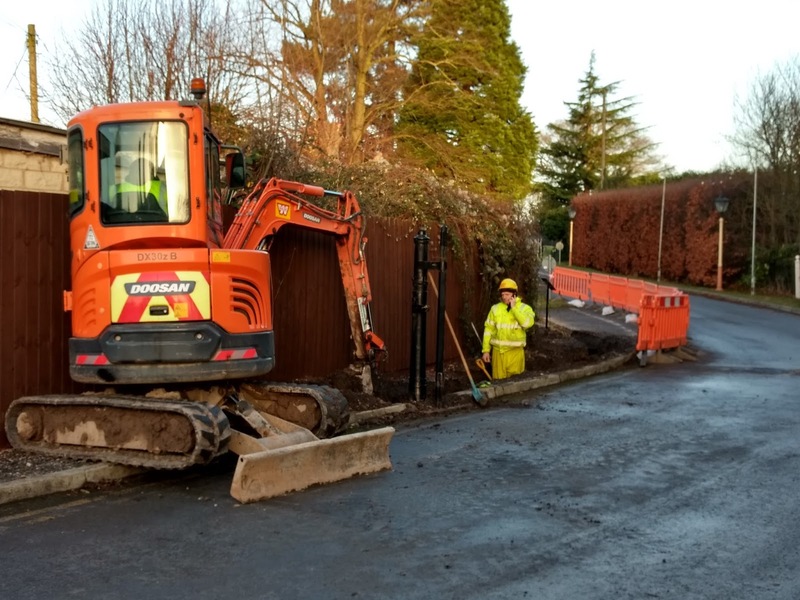 In the trench a new pipe will be laid to take the sewage we generate up to a mains sewer in the road, from where it will flow by gravity. 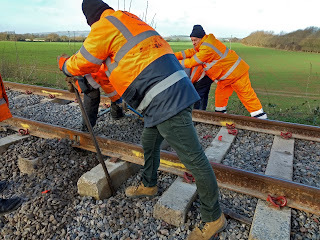 It would have been useful to take out the disused GWR level crossing post while they were at it, but it seems the post was fixed to a very large lump of concrete, so no can do. After tea and doughnuts (sadly now spaced out one bag per table, so no repeat of last week's animal like scrum) we divided into three teams. 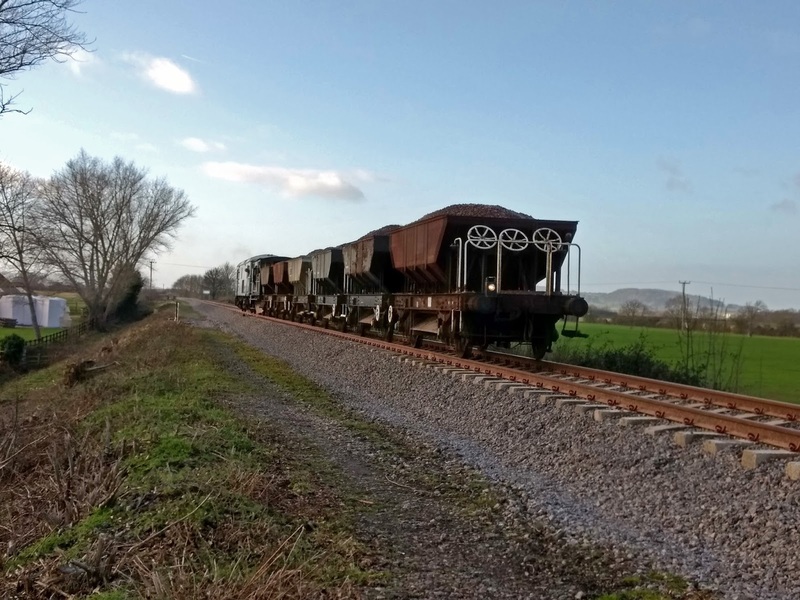 One went to Winchcombe to plate up 30 hardwood sleepers with Pan 11 base plates for use when we replace the track over Gotherington Skew bridge, currently being worked on. Another team of two took a generator on the red Transit to Broadway and then worked south, cutting off occasional bolts that stuck vertically out of the sleepers in an unfriendly manner. The last, and biggest team went to Peasebrook. 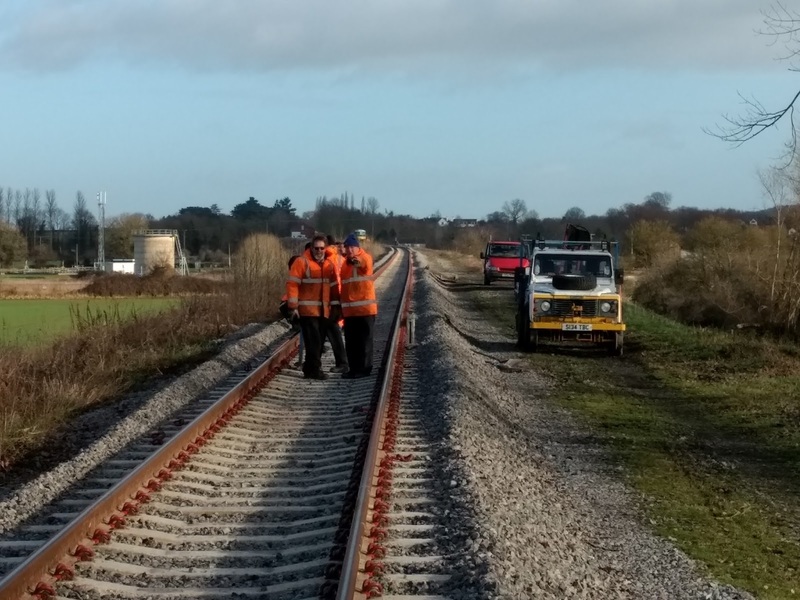 One kilometre of track has a lot of clips in it, so this week once again we resumed our Clipathon. Even a board director was seen in action here. Talk about getting your hands dirty. What do you mean, you want a lightweight bar, made of Aluminium I suppose? The Landie was started up next to its pile of snow at Toddington (yes, it's still there, but now looking somewhat shrunken and dirty), and, passing via the site safe at Broadway, we drove it with all the tools down the trackbed to where the gang had assembled. So all along the 1km length, three out of 4 clips still remained to be put in. Eventually we reached the pulling point in the middle here, where the sleepers had also dropped and gotten pushed around a bit. This picture gives you an idea of the exposed situation of the embankment at Peasbrook. There was a stiff breeze, and with an air temperature of only 3 degrees C, the windchill factor was painfully felt. Never mind that it was sunny, it was still freezing out there. 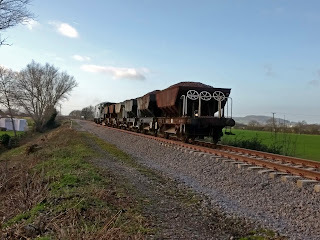 After a while there was a distant toot, and one of those 'non running' trains appeared round the Little Buckland bend. It was the class 73 with the first of two ballast drops for the Broadway end of our extension. 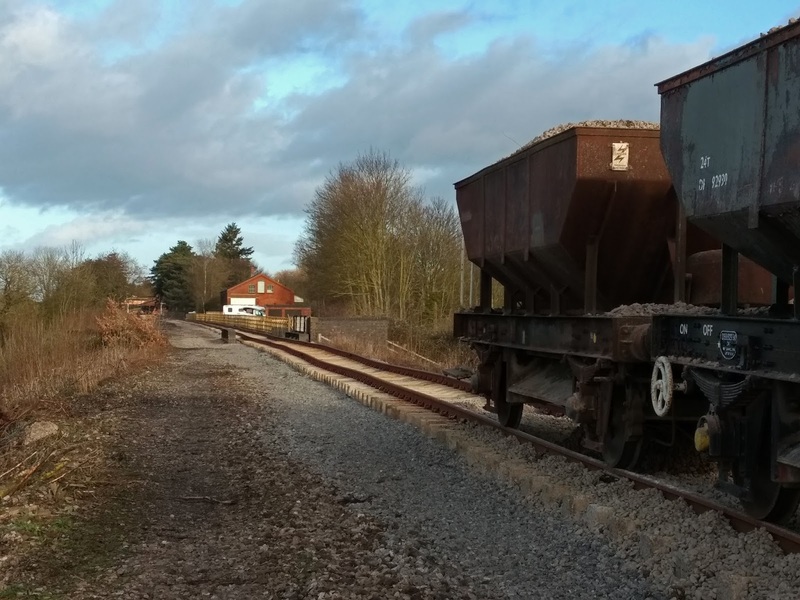 It trundled by gingerly, on its way to Pry Lane, where the previous ballast drop had ended several weeks ago, and which was also the place up to which the line is currently tamped. 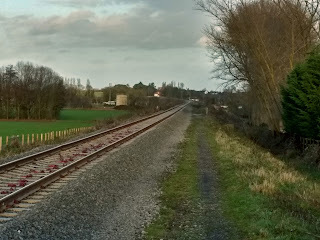 With the train now manoeuvering in the far distance we paused to take stock. At this point we had done about 400m and were almost at the central pulling point. 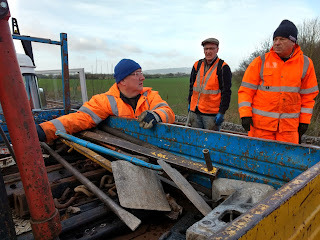 Behind us a lovely, neat row of clipped up Pandrols, ahead of us a jumble of materials and sleepers not quite in their place. 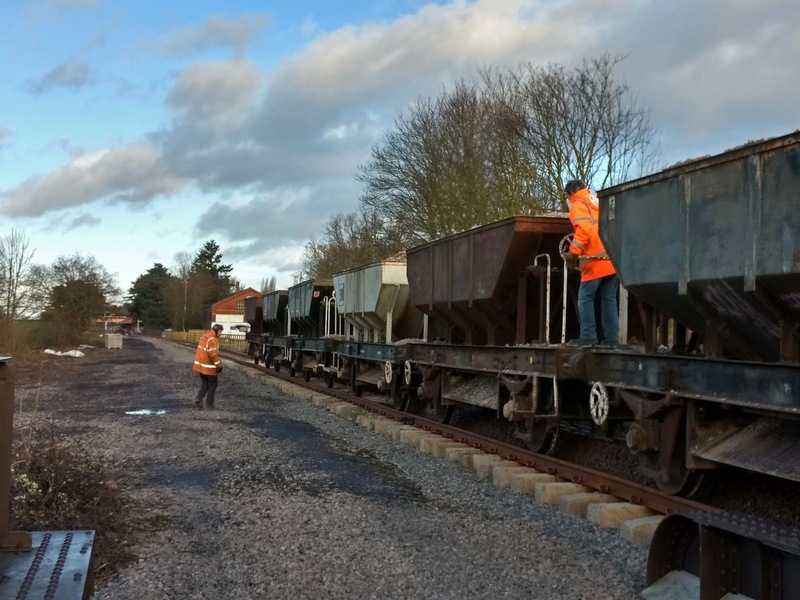 It doesn't seem to take very long to drop 120 tons of brand new ballast as the train, now empty again, soon returned. Check out the neat row of clips here. This is a stretch we just completed, phew ! Note also the heavy Duff jack, which is needed for the most difficult of cases. Given the expected train movements today, we couldn't use our trolley, so the old jack was carried along, bit by bit. Kept us warm though. Around lunch time we reached the centre of the stretch. 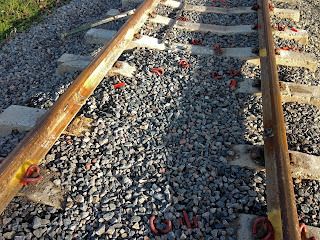 Here the sleepers had been pushed a bit to one side, to make room for the pulling machinery and afterwards the welders. One offending sleeper was dug out and levered along a few inches, to even out the spaces, the back filled with ballast. All looks nice and neat now. 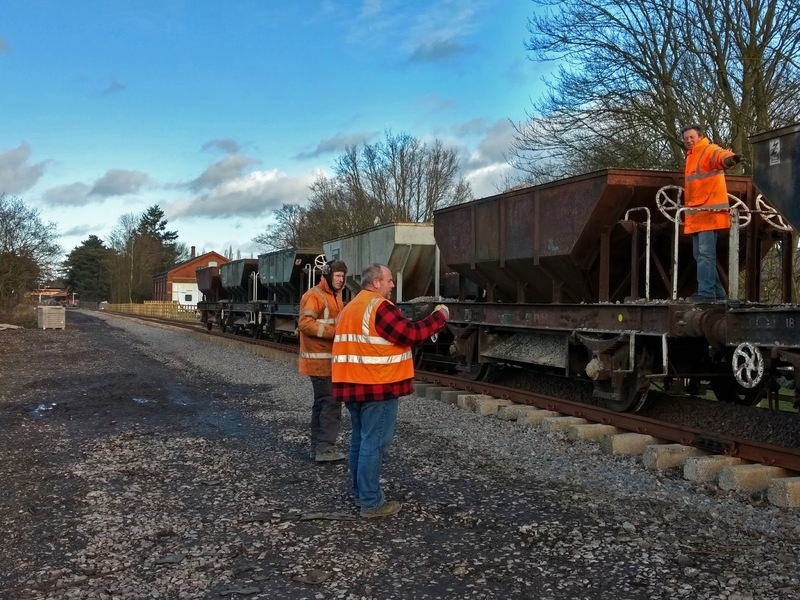 After lunch a second ballast train trundled up, and this time it stopped. 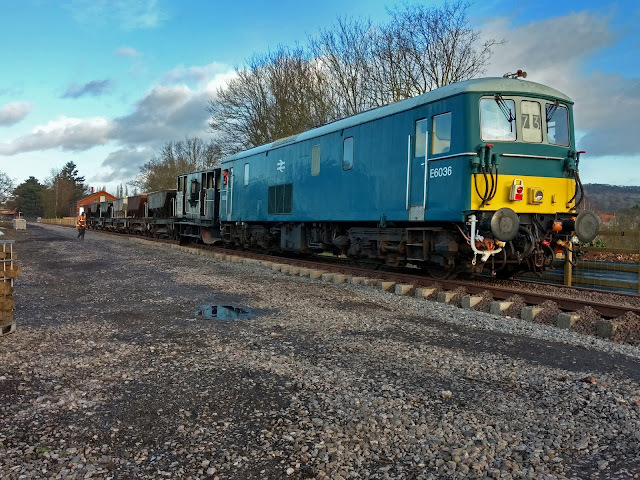 Your blogger seized the opportunity to clamber on board and join the gang discharging at Childswickham. Just for the pictures, y'know. A service to the public.... back soon. The first drop took the ballasted track from north of Pry Lane almost up to the Childswickham bridge. Here we see the second train parked at the end of the first drop, so that the doors can be opened and the plough wound down. 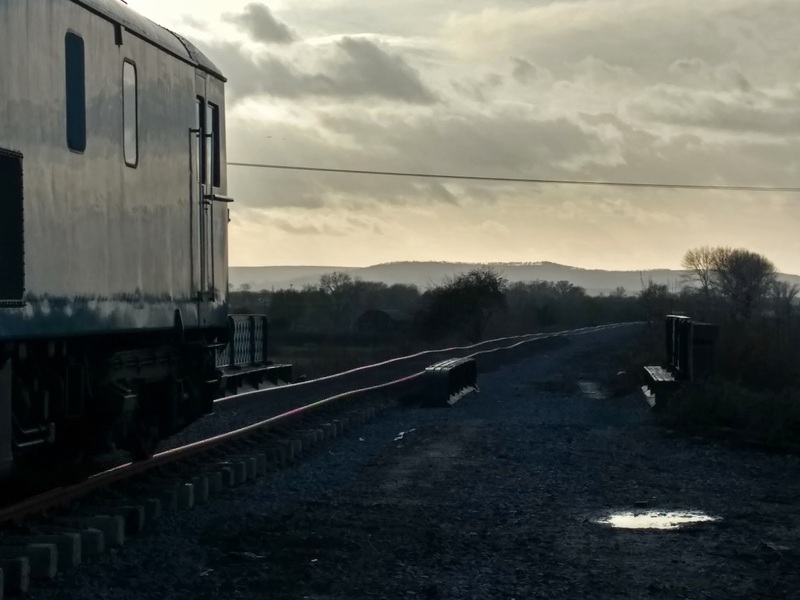 The Broadway goods shed is in the distance. Reversing slowly up to the Childswickham Road bridge. Just before the bridge a technical stop was made to check that everything was going to fit, and then the drop resumed over the bridge itself. 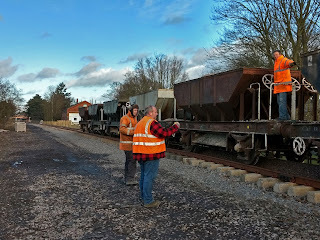 Lee is working the fifth hopper doors here, while Andy on the ground is directing Neil in the loco, so that the train stops when the final wagon has completed its discharge, and the plough has heaved a proportion of the content over the rails. 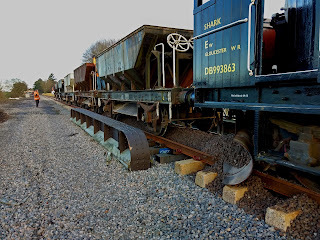 In the foreground you can see that initially the ballast just drops between the rails and stays there; the shark coupled to the front of the loco then completes the manoeuvre by heaving the surplus ballast over the rails. 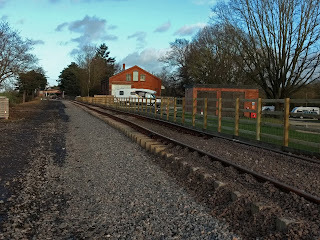 With the drop complete, the train comes to a stop a few yards short of the goods shed. You can see that here the drop has not been sufficient to cover the sleeper ends in the foreground. Got another Dogfish full, see. A pow-wow is held. Lee has a trump card up his sleeve (all magicians have this), which is the sixth Dogfish, which he didn't open. Now it comes into play, as we give the last, insufficient stretch a little top up, and then the quantity dropped looks right. 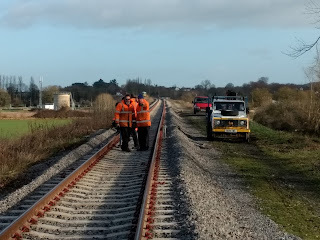 A view behind us, showing the untamped track undulating into the distance, and the shortage of ballast (at the time) in the foreground. Clouds race across the sky, the puddle is frozen. Here's the end of the day look towards Broadway. 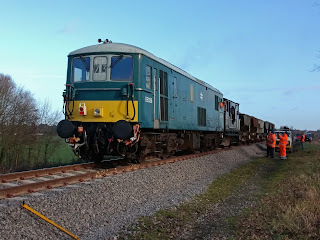 This is where today's ballast drop ran out, and from here to the southern turnout one more train load will be required. Work on repairing the bridge is said to be well on schedule, so we hope that further ballast drops right into, and beyond the station, will resume soon. In the station itself the pits for the canopy overhang supports (on the right) and the intermediate staircase landing (on the left) have been excavated, and two out of three fitted with shuttering for the concrete. At the end of the day Neal was measuring carefully from the building itself to ensure the columns will be exactly in line with the rest of the canopy. The bottom of the stairs will be supported by two newel posts in the form of ball topped gate posts of the era, for which we have a pattern. 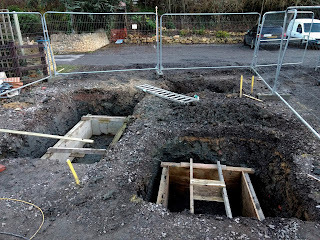 Their foundation holes will be dug (on the far right of the picture) once the first three holes have been filled with concrete, to avoid thin walls between them and the subsequent risk of collapse. 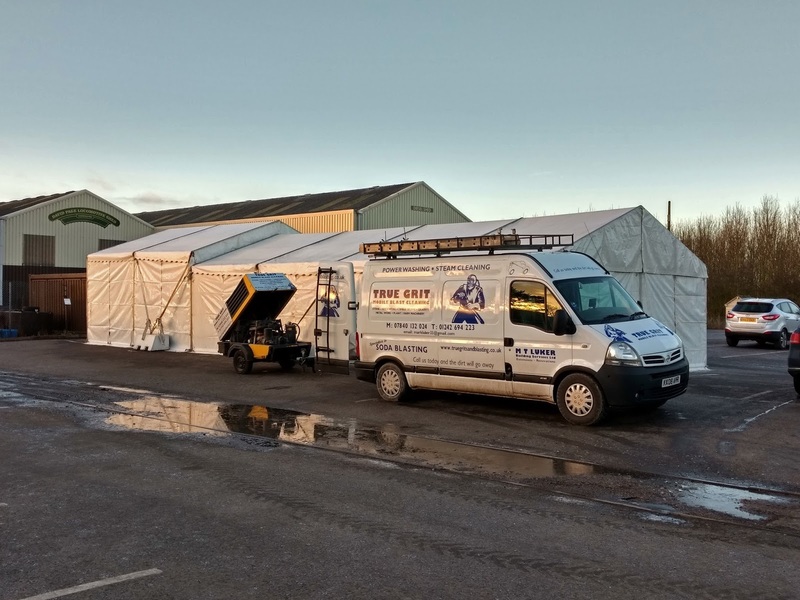 While we don't currently have any funds to actually build the canopy overhang, it is now clear that we have an agreed design at last, and one that will achieve very nearly a full length canopy overhang (6m out of the original 7m). That's an excellent compromise, and it will look right. 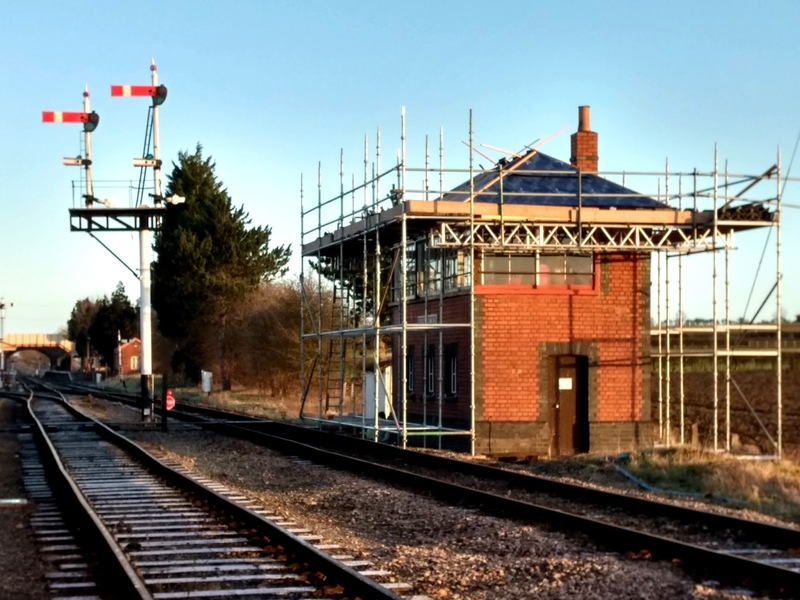 The circulating area under it, illuminated by a double row of Victorian style glazing and a large replica hexagonal lamp, will be the cherry on the cake at this end of the station. On the way home in the Lndie we stopped to take this picture of the work we did today. We started on the far side of the underbridge just visible near the end of the row of trees on the right, and ended up well this side of the pulling point. We are hopeful of completing this job next week. Weather permitting... at least we were in the dry today. Mustn't grumble. Well done! :) wow! Base for stairs and canopy started! 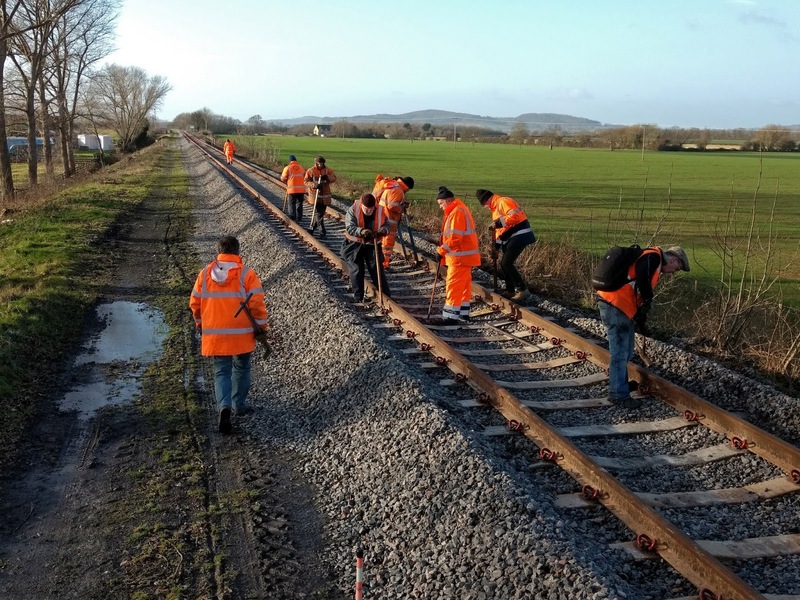 Well, back to the GWSR, I see the tough slog along the track is coming on very well indeed, despite the wicked cold. 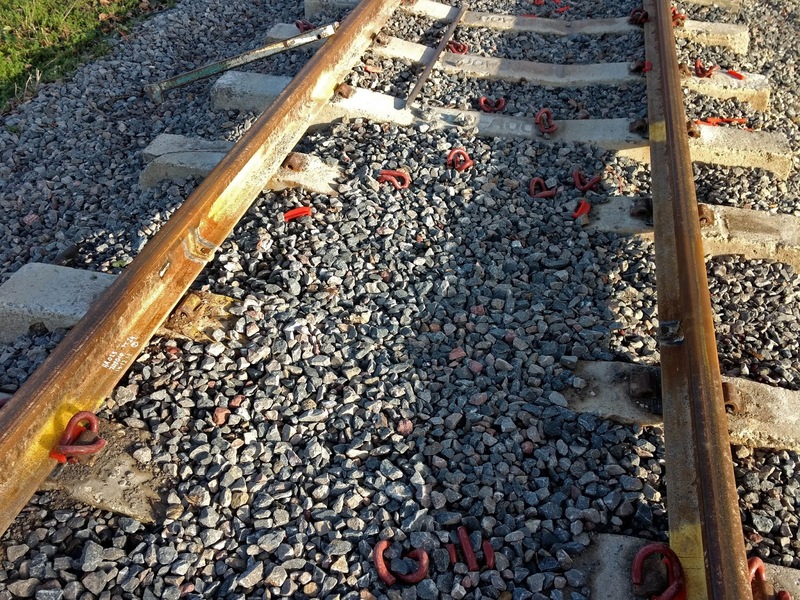 I can see the difference as the ballast is dropped and the rails are clipped (or should that be the other way round ?) 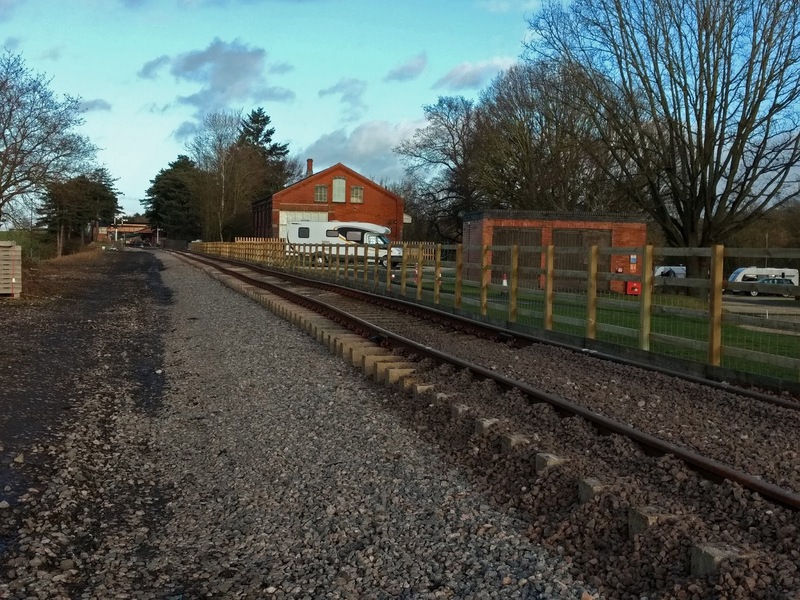 When you can once again run ballast trains over the Evesham Road bridge into Broadway, that will be marvellous. Carry on, gentlemen (weather permitting) ! It may seem mundane to some, but very necessary. Also, not a particularly glamourous job, but where would we be without the pandrols? On the dirt is where! So well done to you all (even the gricer on the train - who was that man?) for working in this icy wind. Also thanks for the foundations for the footbridge stairs and canopy extension update. Regards, Paul. 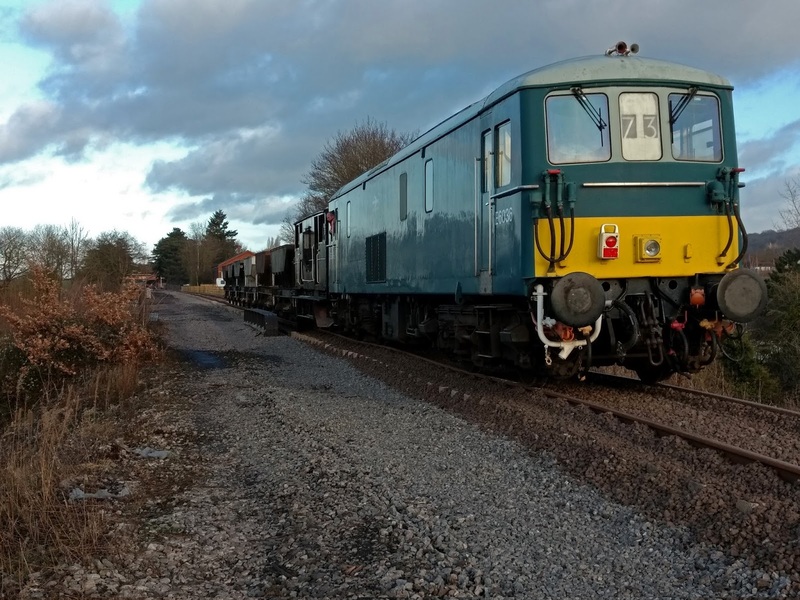 Although it's not part of the Broadway extension, thank you very much for posting the updates on loco 76077. It is very heartening to see progress on this kit of parts after so long. Also keeping my fingers crossed that you don't have the same weather as the Scottish Borders any time soon! Thanks for the video Jo, amazing work there in this weather! Who said that there's not a lot happening! Great progress in less than ideal weather. 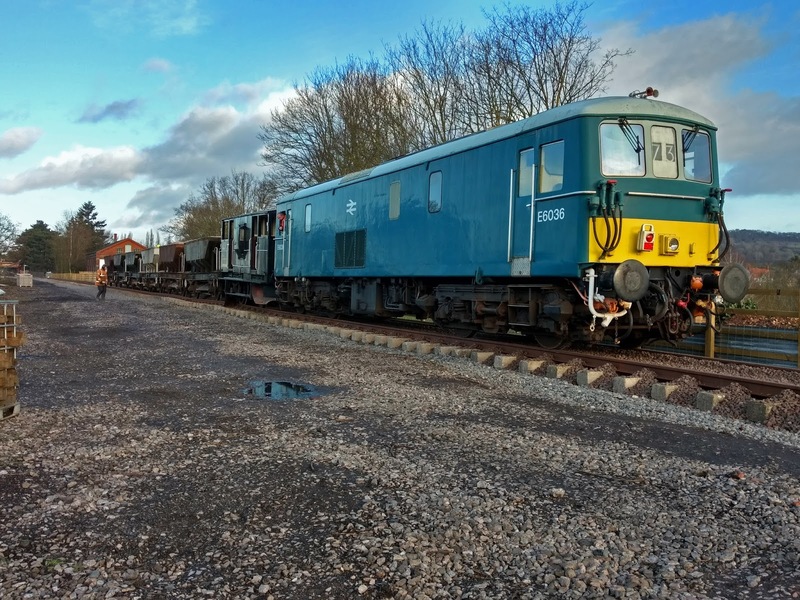 In time will the ballasting and tamping be carried out on both the headshunts up to Springfield Lane or as non-running line will these left as are? 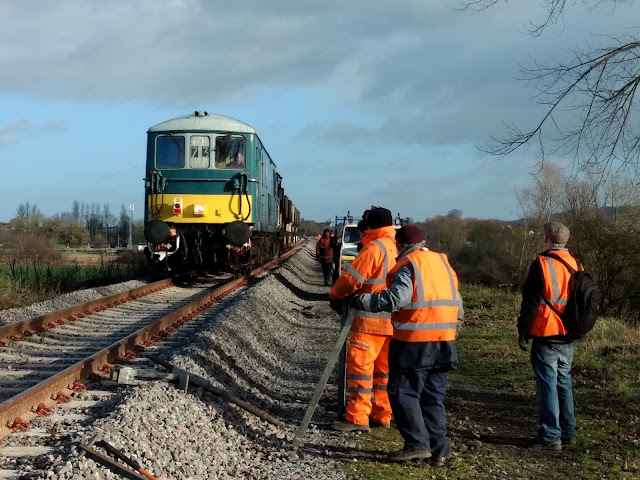 I,enjoyed the video!.Although I,sometimes worked on Sunday relaying jobs,I,was usually on the pilot loco,which took the human token,(Single line,Pilotman)Maybe a fund,between one signal box,to the next,in the section.So I,did'nt see much of the actual relaying work!.Perhaps a fund should be started to raise the money,for the canopy extension/ footbridge stairs!. Anthony. I just had another look at the planning application drawings and something confuses me. The canopy overhang is shown there as 4m long - now you say it is going to be 6m. Is this a change done when it was decided to make a replica canopy rather than the original roof design?